Shop Portable Stages: Choose From Our Great Selection! Your performance has one chance to make a great first impression, and a portable stage from Hertz Furniture will provide the platform for success. Our fully connectable mobile stages come in various heights, depths and surfaces to accommodate all types of events. What kind of stage is mobile? 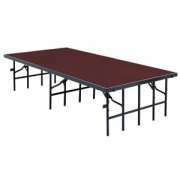 Sturdy folding portable staging will get traveling shows on the road and all set up in no time. Whatever the size or style of your performance, whether you are just practicing or doing the final show, Hertz Furniture’s great selection will help your actors, singers and speakers earn that standing ovation. Don&apos;t have enough room in your building for a full auditorium? Looking for a way to transform your gym, social hall or multipurpose room for a special event? A portable stage can turn virtually any empty room into an instant performance space. This is a great solution for institutions that host concerts, performances, guest speakers and other special events. What size stage do I need for a performance? Every play and concert requires a unique setup, that&apos;s why Hertz Furniture has portable stages in a variety of sizes and heights. Stage risers can be ordered in all-inclusive packages or as individual platforms. Individual stages can be connected via built-in devices to create larger stages and unique configurations. Some models offer both level-to-level and dual-height arrangement capabilities. Dual-height stages can be used creatively in conferences, plays and performances. The ideal stage height depends on what purpose it is needed for. Lower models are good because they don&apos;t require great leaps or steps when alighting or descending. They are also safer, which is especially important if you performances include young children. Higher stages provide better visibility which is especially good for large rooms where people are seated farther away from the stage. Of course, you don&apos;t want your mobile stage to be too high, because most audiences won&apos;t appreciate having to crane their necks to see. If you want maximum flexibility, you need an option that can be set at varying heights. Dual-height stages from Midwest Folding Products can be field-adjusted as needed. With this arrangement, you don&apos;t have to decide what you will use the stage platform for before you order it, and can adapt your stage to fit a number of purposes and functions. How can I make a stage safe? For maximum safety, you should make sure to order guardrails for the sides and backs of your stage platforms. If you want a high stage, you will also need to get steps so speakers and performers can easily ascend and descend the platform. 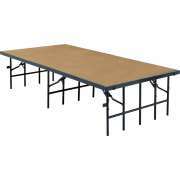 Of course, the most convenient way to ensure that you have everything you need is to choose a preconfigured stage set which includes guardrails, two sets of steps and skirting. What is the easiest way to transport stages? Even when they are folded compactly, stages can be complicated to move from place to place. Without the assistance of special equipment, stage transport will undoubtedly be a multi-person job. Stage caddies and dollies are super convenient because they enable an individual person to move platforms independently. They also offer a great place to store stages when they are not in use. What&apos;s the best stage surface material? 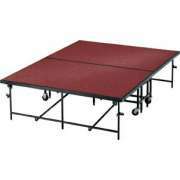 Portable stages come with either carpeted or hardboard surfaces. Each material has its advantages and preferred uses. Carpeted stage platforms are good for presentations, church services and concerts because they minimize noise from people moving around on stage during a speech or performance. Hardboard is a better choice for dance performances and some dramatic performances as well. Hertz Furniture offers an excellent selection of portable stages. 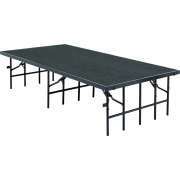 Our mobile stages come from reliable manufacturers including National Public Seating and Midwest Folding Products. If you need help determining which option will fulfill your budgetary and spacial needs, don&apos;t hesitate to call the Hertz Project Solutions team for a free consultation and project planning advice.